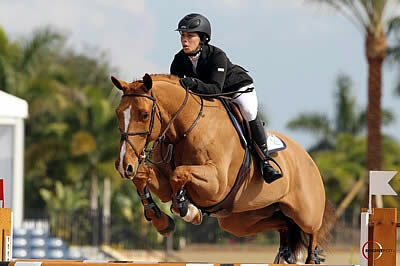 Ashlee Bond (USA) and Little Valley Farm’s Chivas Z finished in fourth with a clear round in 36.07 seconds. Fifth place honors were awarded to Brianne Goutal (USA) and Cloverleaf Farm’s Nice De Prissey for their time of 37.22 seconds, and sixth place went to Nick Skelton (GBR) and Big Star, owned by Beverly and George Widdowson, who stopped the clock in 37.31 seconds. Kate Levy (USA) and Vent Du Nord totaled four faults in 35.21 seconds to place in seventh, while Charlie Jacobs (USA) and CMJ Sport Horse LLC’s Ladybird 17 clocked four faults in 37.34 seconds to round out the jump-off in eighth place. Pasmore considers today’s win the second biggest of her riding career, ranking just behind a $40,000 victory in the Old Salem Farm Grand Prix this spring, also with My Boy. Although that class had more prize money, Pasmore noted that today’s class was definitely the biggest win over the field of riders that were in attendance. Pasmore has owned My Boy for a little over a year and purchased the handsome chestnut from her trainer, U.S. Olympic gold medalist Laura Kraut. Kraut found the horse when he was showing with Lance Whitehouse at Nick Skelton’s Farm in England. In addition to earning the top prize in today’s WEF Challenge Cup, Pasmore was also presented with a $3,000 bonus for riding in her SSG Gloves during the class. The SSG ‘Go Clean for the Green’ promotion will be offered weekly in the WEF Challenge Cup Series. If the winning rider is wearing SSG ‘Digital’ Riding Gloves with the SSG horse head logo clearly visible on the wrist, they will be presented with a cash bonus during the awards presentation.